The Model 5000 Altimeter offers a high contrast, backlighted liquid crystal display of altitudes from -1,000 to +19,990 feet in 10 foot steps. 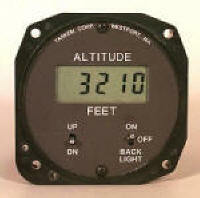 It can also be set by the end user to display equivalent altitudes in meters with a 1 meter resolution. It is intended primarily for ultralights and is powered from a 9V battery or external power up to 30VDC. It is FAA certified for use in hot air balloons.